Cherilyn from Colorado told me about a site of lesson plans and lots of downloadable materials authored by Deborah Carder of Arkansas. Cherilyn has been using this site as a guide for her first year of teaching physics. I can see why, it’s loaded with great ideas. Deborah has the entire year mapped out from the first to last day of school. Included as downloadable files are worksheets, lab files and Powerpoint files. I plan on downloading every single file and going through it with the intent to steal it all. Before you think poorly of me, Deborah gave me permission to use as much as I like on this site. I’m an honest thief, I will certainly credit her for all of her hard work. Thanks to Cherilyn and Deborah. I like this company. I just ordered three constant velocity cars out of my own pocket. The school will hopefully reimburse me, but money is tight right now. Prices are very reasonable and their stuff look so good. I’m really itching to get the Simple Holograph Kit next year. I can just imagine how excited my students would get over something like this. I’m impressed with the gear, but I’m even more impressed with the resources on the site. There are all kinds of lesson plans and lab ideas. I’m going to be stealing from them frequently, you should too. Then tell me what you liked and how you changed it. Under “Categories” on your left, click on “Arbor Labs” to get at their lesson plans. There is also a “Coolstuff Newsletter” with lots of labs and activities. I had been talking about doing an egg drop but didn’t have any place. They mentioned that you can arrange for the local fire department to bring a ladder truck and do the drops for you. I never thought of that, but I’m going to make some phone calls and find out. I had some fun with the kids today. We first had a discussion about the scientific method, discussing the steps. The classes are just starting their Mythbusters project (check in a previous post), so I wanted them to start thinking. I put out two beakers and let them assume they were both water (one with water, the other was alcohol). On the board was the hypothesis, “We believe the two liquids are different.” I then asked them to come up with ways to test them. I got lots of good stuff; freeze them, boil them, test their acidity, put objects in the liquids, etc. Then I turned the lights out and tried to light them. The alcohol burns with a cool blue flame. They liked that. 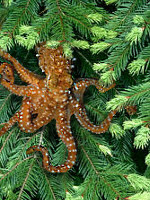 Next, I handed out an article on the almost endangered tree octopus. (http://zapatopi.net/treeoctopus/) If you aren’t familiar with this creature, you must read the web page. I did my very best to play this straight and we talked about ways to protect this creature. This went on for a good ten minutes until I finally told them it was totally made up. The point was that they weren’t being critical at all. If a teacher gave them information, it must be true. If it came from the internet, it has to be true. The newspaper and TV are never wrong. They never challenge the information or do any checking on their own. The last step was that I told them how they can pull a car from the mud by themselves with a rope and a tree. Now they decide not to believe me. They demanded proof. This is my physical science class, so they won’t be calculating the vector forces. Instead, I showed them how it works with a martial arts escape. I have two large kids come up front, each grabbing one arm and pulling opposite. The escape is to take a small step backwards and gently pull them together. The kids will come crashing into each other with quite a bit of force. You have to be careful or they will hurt each other. I then recapped how I gave them a statement, they demanded facts, and I backed the facts up with tangible proof in the form of a demonstration. Finally, they agreed with my statement because it was backed up. There was a small problem with the printed article. The picture above looks really bad after printing and copying. If I do this again next year, I will put a color picture from the web site on the overhead or perhaps just grab the projector and show the page on the screen. I don’t have access to a computer lab, so you won’t see a lot of computer based lesson from me. If anyone has lesson plans to be used with these or any other simulations, I’d love to post them for everyone to use. I’m going to see if I can get Trefor to submit his lesson plans for this site. Check back here and see if I was successful. The collider at CERN was just turned on this week and the news was all about the possibility of the scientists creating a black hole that could swallow the Earth. Fortunately I’d been doing my reading and was able to talk about how these black holes, if created, would evaporate so quickly that the instruments would only be able to detect them by the residue. This lead to a discussion about particle accelerators and what they do. I came up with two analogies. The first is the collision of two cars. The vehicles are the atoms, but when they collide, the car is smashed, but we can detect the smaller parts of the car by the bits of headlight and metal strewn about. The collision of the hadrons gives us a glimpse at the world of sub-atomic particles. A second analogy was an idea for modeling the protons within the accelerator. I grabbed a couple small rare earth magnets from my cabinet and showed how a certain amount of force is required to separate these magnets. The magnets represent the sub-atomic particles. Smaller particles can be separated with a smaller energy collider. To get the bigger magnets apart, we need a bigger collider. I give this homework assignment about a week into school. I used to do it the first or second day, but I prefer to get to know the kids a little first, it makes the assignment more valuable to me. Basically, I ask them to tell me about their background in science, their likes and dislikes. The students like this assignment because it shows I want to listen to what they have to say. Although the assignment say for them to type it, I usually tell them to hand write the thing, it seems more personal. It also gives me a quick assessment of their writing and language skills very early in the year. One last point – I ask them to write about the environment they work best in, so I use their writing to define my classroom rules since the students wrote them. When I started this blog, I figured a few people might get something out of it. It’s now just three months and I’ve had over 11,000 page views. One day last week the blog had over 500 hits – it blows my mind. Thanks to everyone that wrote me to say you found my work here useful. I’m happy to carry on email conversations with anyone who can use a hand or has something to share. I’m never afraid to ask for help and I’m just as happy to give it. I appreciate the recommended web sites and other additions from the other teachers out there. Keep those ideas and comments coming. School starts tomorrow and right now I’m stressing over teaching Physical Science to seniors. There is no existing curriculum, it’s going to be so much work starting from scratch. But I’m going to keep adding new ideas as I come up with them throughout the school year.